A modern, “Spanish-style” cement house of approximately 2,500 sq. ft. having 4 bedrooms and 4 ½ bathrooms. The main building’s living and kitchen areas are light and airy and overlook the pool and grounds. The kitchen has mahogany cabinets, granite counter tops and stainless steel appliances. There is a large walk-in pantry and, in the living room, a contemporary entertainment centre. The spacious master bedroom features a walk-in closet and the bathroom has a walk in shower, jetted tub and his and her sinks. Each of the other two bedrooms have their own private full bathrooms. The house boasts several verandahs and a balcony that overlook the pool and the garden. There is a separate guest bedroom and bathroom in a private suite detached from the main house. 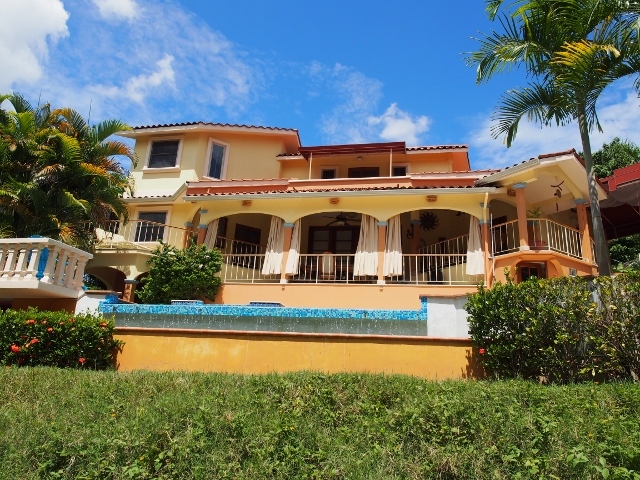 The house is tastefully decorated, tiled throughout with attractive travertine tiles and there is a/c in every room. It has all utilities and comes fully furnished with quality furniture and appliances. An outdoor dining and barbeque area overlooks the salt-water, infinity pool and the beautiful Cayo countryside. A jacuzzi, an outdoor shower, and a half bathroom are located in the pool area. The property is designed for outdoor entertaining with a wrap-around patio over-looking the pool and jungle. It also over-looks the beautiful Macal River. Also on the property are a maid’s bedroom and bathroom, a two car garage, three car covered carport, utility room, and storage room. A concrete wall surrounds the property and an electric gate and security cameras provide good security. The approximately 1/2 acre lot is professionally landscaped and maintained and has many fruit trees including: bananas; coconut; mango; avocado; and citrus. The property is located on the Santa Elena side of the Macal River and is only minutes from the downtown area of San Ignacio. San Ignacio is a friendly, bustling tourist town and is popular with ex-pats.